One of my most vivid memories of my childhood was a family vacation I took to South Carolina. Despite getting to see the ocean and rows upon rows of crab restaurants, the thing I remember most was a CNN report about Grand Theft Auto: San Andreas that I watched with my family. Recent news had surfaced about a Hot Coffee mod for the game Grand Theft Auto: San Andreas that allowed for players to simulate sexual acts with NPCs in the game. At the time, when I was watching it I thought nothing of it. I had seen plenty of similar mods for other PC games and had ignored them. To me the mod and the publicity surrounding it was just goofy, but when I turned to my parents that night, I clearly remember seeing something had changed in the way they viewed video games. After that day I saw a little more hesitance from my parents when it came to gaming. More-so, there was less discussion about it, the idea of video games had been changed by that Hot Coffee mod and it took a while to bring it back. No longer was it the thing that their son did for fun. Instead, gaming took on an adult quality that threatened to disrupt the normalcy of life. These sorts of incidents are not uncommon in the world of gaming. From Super Columbine Massacre RPG, RapeLay, JFK Reloaded, and Kaboom! have all garnered national attention for their extreme content and have left scars on the face of gaming. The latest game in this trend is Hatred, a new top-down shooter that tasks players with killing as many innocents as possible in massacres that resemble many of the massive shootings that have happened recently. The fact that we are one week out from a mass shooting threat against a game critic, shows that the game exists only to push peoples’ buttons. The trailer reads like an edgy teen’s diary, and comments from the game’s developer Destructive Creations state that Hatred is a response to “political correctness” in gaming. Hatred has only been made been made aware to the public for one week and has already brought about lots of talk from sites like Polygon and Destructoid. And that’s where we get into the real issue of Hatred, because it’s not just games journalists and sites talking about the game, national news has picked the story up, and the conversation begins again about violence in video games. And that conversation is one that deserves to be had, but when these discussions are centered around the most extreme cases of violent games, such as Hatred, the conversations become skewed. Look at the comment section of anyone of these news stories and you’ll see people calling for an end to gaming, claiming that gaming has once again gone too far. And in a way, yes, that’s absolutely true. 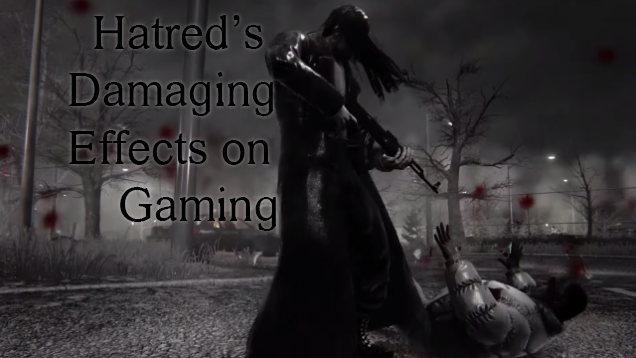 Hatred and many other games like it go too far. But that doesn’t mean they get to be the poster children for all video games. For every few steps forward that gaming takes, there will always be a Hatred or Super Columbine Massacre that will drag it back. Now, I’m not saying offensive or suggestive material have no place in gaming. In fact, if handled in the right way, they can help further the medium as whole. Games like Hotline Miami, The Binding of Isaac, and How Do You Do It explore issues of violence and sexuality on a more thoughtful level that games like Hatred will never reach. Unfortunately, games like those don’t get the same kind of attention that Hatred will receive because they actually go beyond just senseless murder and explore deeper issues. Those are the type of things we should be putting out into the mainstream, because when we don’t, games like Hatred come in and change the mainstream perception of gaming in the worst way possible.